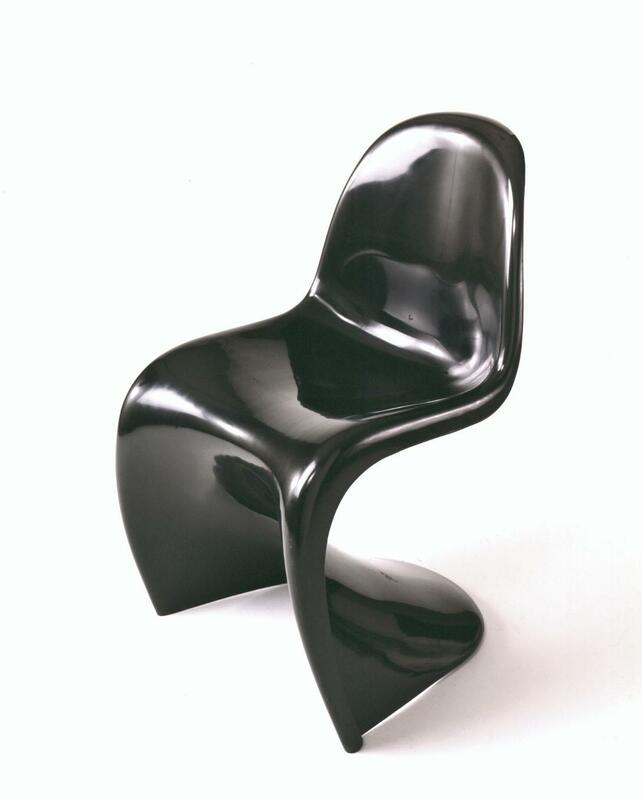 The Panton Chair was the world’s first molded plastic (fiberglass, polyester) chair and is considered a masterpiece of Danish design. The Scandinavian style chair forms a single, continuous molded surface in highly reflective black plastic, which is shaped into a modified ‘S’ with contoured back and seat areas and rounded corners. Verner Panton for Herman Miller, Inc. Designed by Verner Panton, who was said to be inspired by a set of neatly stacked plastic buckets. Panton, 1926-1998, was considered one of Denmark’s most influential designers, both of furniture and interiors. ‘1973’ & Herman Miller logo on the seat bottom. Measurements: 32 ¾ in. high, 19 in. wide, 17 ½ in. long. This image was reproduced with permission from the Grand Rapids Public Museum. Photographs may not be reused without permission and must credit the "Collections of the Grand Rapids Public Museum." For rights and reproduction information contact: Grand Rapids Public Museum, Collections Department, 272 Pearl Street NW, Grand Rapids, MI 49504: Phone 616-929-1809.